Home » Halloween » RUN AWAY! RUN AWAY!! Certain fears are so common that you’d probably be able to drag a good related story out of anyone you come across. Spiders is one of those fears. My story involves my mother and this huge desk that we used to have in the family florist. That thing was a rather high desk that required stools and a front that provided privacy. It was about 4 1/2 feet high. Behind that desk was the computer, where my mom would sit and input orders and things. One day, she’s doing just that, sitting at the computer entering orders. Suddenly she sees this long, thick leg expose itself on the top of the monitor. That was enough for her. She did a 180 and flew right over that desk to get away from what I’m guessing was a rather big cane spider. I still remember watching Arachnophobia in the theaters and having the great misfortune of realizing that during the movie, I had taken off my shoes. It took me a while to get up the courage to put them back on. 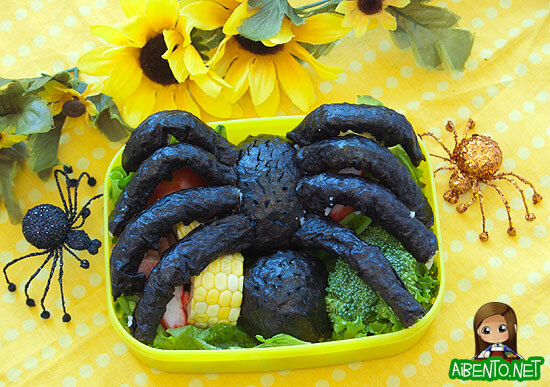 If you weren’t sure, it’s basically a “sushi” spider. I wrapped two nori paste filled onigiri with nori and then cut strips of nori to make thin “sticks” of sushi for spider legs. I assembled a bento around the body, then cut the four strips in half and attached the legs to the body. The rice at the ends provided the glue to hold the legs together. I didn’t stop with the spider though. I had been brainstorming yesterday for ideas on how to make it a hairy spider and in the end I remembered that black seaweed stuff. I couldn’t remember the name, so I asked Erika and she told me it’s called hijiki. I broke off pieces of the stuff and poked it into the nori, which I’d wet to make into a nice ball, so it was pretty soft. Looks horrifying doesn’t it? I’ll be honest, I was so creeped out I didn’t even take it to work for lunch. 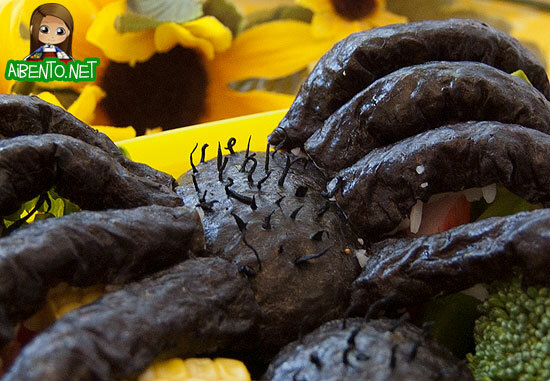 I’ll see if I can bring myself to eat it tomorrow if I remove the legs. We went to Ben Franklin yesterday to buy stuff to make caramel apples and we ended up buying this huge fake spider that I hung in the doorway to the kitchen. Baby Girl seemed fine with it at the store, picking up one and fighting with Buddy’s spider and everything. Then later at home, while she’s coloring, she suddenly gets up and comes to me saying, “Mommy, mommy, it’s spinning! It’s looking at me! It’s REAL! !” LOL!